A natural substance that provides a strong anti-inflammatory from the high levels of gamma-linolenic acid (GLA), borage oil comes from the seeds of evening primrose and borage plants. It typically can't be found in necessary amounts in foods common in the human diet. This requires supplementation. With specific consumption of the oil, it makes using this powerful and impacting oil all the easier. Here are some of the ways in which this oil can be a staple presence in your medicine cabinet. Inflammation can be one of the toughest things to deal with. It can occur and manifest in many different ways and cause illness and exacerbate already current issues. 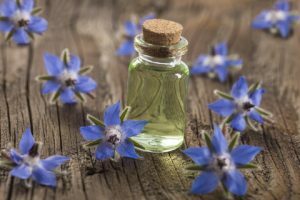 Luckily the polyunsaturated fatty acid present in borage oil helps to release specific molecules that combat the body's inflammatory responses. There is also an acid within this oil called dihomo-y-linolenic acid that also helps to dismantle inflammation. So those who suffer with inflammation-based issues such as arthritis and respiratory disorders can find some relief with this oil. Just a few drops applied to the problem area and rubbed in will provide some much needed relief. The anti-inflammation properties of this oil are so wonderful that it makes for a great aid for skin issues as well. Whether you are suffering from eczema, psoriasis, acne or other skin issues, this oil will help to mitigate the swelling and inflammation that comes with these issues. One of the most difficult elements of dealing with these skin conditions is how painful and intense the inflammation can get. Borage oil helps to combat this very frustrating struggle. If you are worried about gaining weight, like many of us are, you may want to start incorporating food-grade borage oil into your recipes. There is evidence that shows the GLA within the oil helps to lessen the likelihood of the accumulation of body fat. Many people aren't aware that the way fats are stored in the body differs. That brown fat, which is the result of GLA, benefits the body and keeps you leaner than the accumulation of white fat. White fat is typically triggered by those unhealthy foods that we crave. Foods high in trans-fat and other unhealthy fats will only drag you further away from your weight-loss goals. Trying to ascertain what will fight and defeat the monster that is cancer can be scary. Taking care of our bodies and filling them with antioxidant-rich foods and things that will help to prevent cancerous cells from taking hold is important. Luckily borage seed oil contains anti-mutagenic properties within its compositional makeup that allow it to fight against cancerous cells. With such a deadly and pervasive ailment, it's critical that we exhaust all of the options possible to use in order to fight cancer in all of its forms. You can purchase borage oil online from several companies at amazon.com.